Reversed: Inner feelings, self-care, self-love, co-dependency. The Queen of Cups is a beautiful, introspective woman who sits on a throne at the edge of the sea. In her hands, she holds a golden, cup adorned with handles shaped like angels. Unlike most of the cups in the Suit of Cups cards, this cup is closed – showing that the Queen’s thoughts and feelings come from her subconscious mind and the depths of her soul. She sits upon a stone throne decorated with images of sea-nymphs, fish, and scallop shells. The sea and fish are symbols of the unconscious mind, and water represents emotion, spirit and perception. A cloudless, bright-blue sky and placid water of the sea surround her. Her feet do not touch the water; they rest on colourful pebbles on the shore. It is as if she is connected to her emotions (as represented by the water), but not overwhelmed by them. The Queen of Cups is nurturing, caring, compassionate and sensitive. When you see her in a Tarot reading, you are embodying her ‘nurturing mother’ energy. You support others by listening with your heart, being compassionate, and caring for them deeply. You are empathic and can sense the needs of others by tuning in to your intuition, and you hold the space for others to express their emotions and be the truest, most authentic versions of themselves. You have mastered this in such a way that, even though you hold space for emotional expression, you don’t take on other people’s energy or emotional issues because you are well-grounded and know where to create a healthy separation. The Queen of Cups says you are highly intuitive, creative, and in flow with the surrounding energies. In your interactions with others, you can easily read other people to get a sense of how to communicate effectively, enabling you both to feel heard and understood. Others may come to you to confide their personal issues regarding relationships, emotions and feelings. They trust you and know that you always have the right solution. You can instantly tune in to what others are going through and can help them make sense of it. You may be a healer, counsellor or intuitive coach; or maybe just a good friend. You recognise the Divine in everyone you meet. In your creative projects and endeavours, you ‘feel’ your way into them, trusting your heart and your inner guidance to lead you in the right direction. You know when something is ‘off’, and you pay attention to this, even if it doesn’t make rational sense. You may be in tune with the cycles of the moon and nature, using these cycles to manifest your goals and live your dreams. 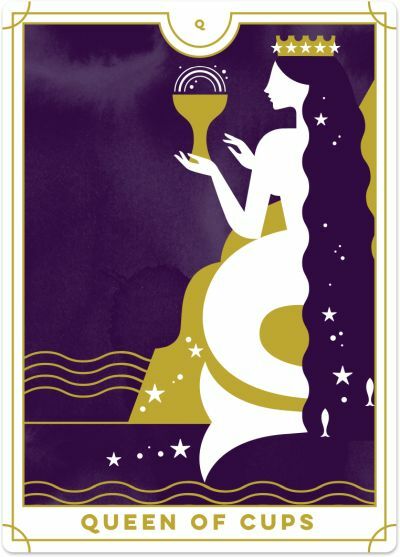 When the Queen of Cups appears in a Tarot reading, you are being asked to trust your intuition and pay attention to your feelings and emotions. Lead with your heart, not your head. Be open to receive the intuitive messages flowing to you, be it through your dreams, meditation or visualisation. And ‘feel the feels’, even if those feelings are tricky or challenging. You are stronger than you know. When the reversed Queen of Cups shows up in a Tarot reading, you need to draw your attention inwards and focus on your emotional well-being. You’re great at taking care of others – but now it’s time to take care of YOU. This card suggests that you are emotionally drained because you have been so busy supporting others, but not yourself. You may need to set firm boundaries with your loved ones so that they know you love them but will not take on their emotional baggage. You can hold space for them, but ultimately, they are responsible for their feelings and life experience, and they need to go on their own journey to learn how to cope. The reversed Queen of Cups could mean you are wrapped up in other people’s emotional responses and have created a co-dependent relationship that is not healthy for either party. You may be giving too much of yourself away, receiving little in return. Or you may be inadvertently fostering dependency so you feel needed. Examine your relationships and see where you can create a healthy detachment. Where can you still give emotional support but not to the detriment of one another? The Queen of Cups reversed is often a sign that your intuition is on overdrive right now, but to hear it, you need to give yourself the time and the space to listen. It doesn’t matter how busy you think you are – see this as your sign to reconnect with your intuition and tune in to your inner voice. At times the reversed Queen of Cups is a warning that you are letting your heart rule over your head and your emotions may overwhelm you. If this resonates, ground yourself, express your feelings privately or with a trusted therapist, and then work through why they’ve bubbled up this way. Be careful not to let your emotions overtake your life in such a way that you worry you are losing control and perspective. Take some quiet time for yourself and meditate or write in your journal. Find a peaceful space to centre and calm your soul. Listen carefully to your intuition and your inner voice. On the flipside, the Queen of Cups reversed suggests that you may be out of touch with your emotions or forced to restrict or hold them down deep inside. You may struggle to express yourself, instead bottling up your feelings. If you do not address these emotional issues, they will reach a boiling point. Your stress levels may increase, and your ability to cope with everyday problems could suffer. The reversed Queen of Cups invites you to explore your innermost feelings and emotions to understand what makes you tick. 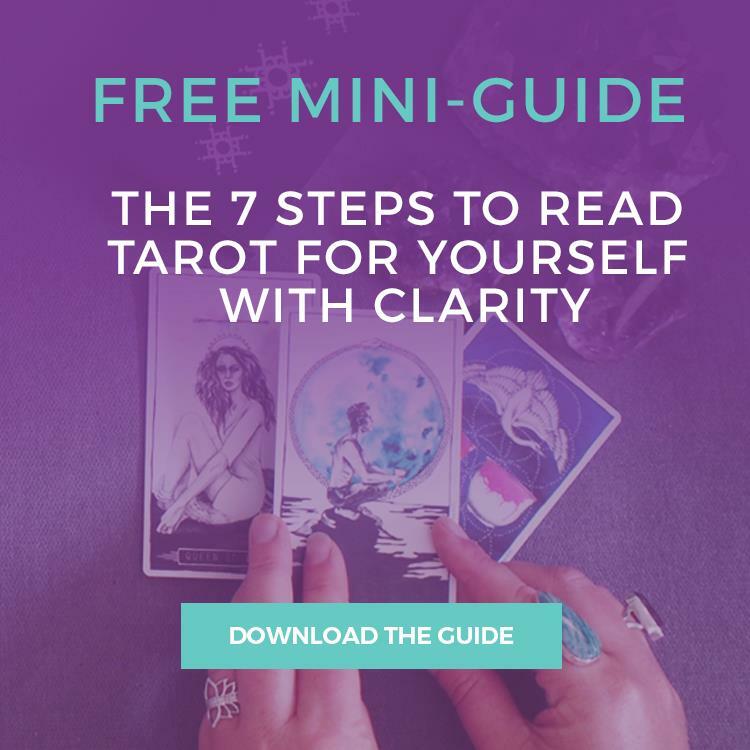 Spend some time alone with just your Tarot cards, your journal and your pen. Connect in with your feelings. How are you feeling? How are you really feeling? It doesn’t matter whether you’re experiencing positive or negative emotions. You are being called to listen to your true feelings and honour them in the process.